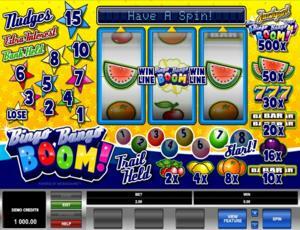 Bingo Bango Boom is a colorfully explosive online video slot game from Microgaming that has been released in May 2008. This online video slot machine game has 3 reels and 1 pay line. The theme of Bingo Bango Boom is all about playing your favorite fruit slot machine game mixed with the popular game of bingo. Considered to be one of the most specially-made slots games which resemble a half-bingo, half-fruit machine more than a video slot game, Bingo Bango Boom is a very entertaining slot game to play at, most especially when they have included Nudge, Shifta and Hold features, which sets this one apart from other 3-reel classic slots. Most Microgaming online slot games are available in 2 formats. The first format is the one preferred by most players, which is the download format. The second format is the Flash or browser-based version, which means there is no need to download anything at all. Whether you like to download or not, Microgaming has slot games for all your slot gaming needs. Bingo Bango Boom is available for instant play only, so you no longer have to download anything. Give Bingo Bango Boom a spin and you will surely see classic online slots in a whole new perspective as this one is not only entertaining, but it is also generous as it gives you many ways to win! When you first play this game, your eyes will become wide-eyed from all the bright and bursting colors that this game presents. But of course, it’s gentle enough on your eyes. If you are someone who loves to play fruit slot machines and at the same time you also like to play a round of bingo, then the Bingo Bango Boom! online slot game is your best choice! You will definitely love to stay and play a while in the cool and amazing features of Bingo Bango Boom online slot game such as the Hold Feature, Nudge Feature, Extra Interest Feature, Reel Bonus Feature, and different Bingo Bango Boom Feature games (Nudge Mania, Cash Bingo, Full House, Bingo Bango Boom!, Spin a Win, Balls Up, Eyes Down, House of Cards), and the maximum cash jackpot you can win is $5,000! The quality of the graphics and sound provided by Microgaming software is totally outstanding. They have an awesome record of making the most impressive graphics and realistic sound effects. A lot of online slot players love Microgaming because its online slot games have smooth animation and remarkable yet non-intrusive background music and sound effects. The slot game looks a lot like a typical pub slot game (half-bingo, half-fruit machine) than a video slot game, but most players don’t mind much whatever it is, because for them it truly is a very exciting slot game for something that has only 3 reels and 1 pay line! The backdrop of the reels display stars with bursting colors of yellow and orange. You will see different numbered stars on the left side of the reels which represents the nudges, extra interest, and bank held. On the right side and on the bottom of the reels, you will see the payout table and the numbered bingo balls. Bingo Bango Boom has been designed to have an authentic casino ambience plus a twist of bingo games with upbeat and lively sound effects. The overall graphic design of Bingo Bango Boom displays main colors such as blue, yellow and orange. Other colors used include red, blue, purple, pink and gold. Bingo Bango Boom does not have too much sound effects and it does not have a constant background music. When you spin the reels, tinkling and zapping sounds from classic arcade games will be heard. When you get special features or winning combinations, you will hear disco background music and a male voice that announces the numbers of bingo balls being drawn out. There are no regular card deck symbols available in the Bingo Bango Boom online video slot game. The regular symbols that you will find in the Bingo Bango Boom slot game are the Boom symbols, Melon, Seven, 2-Bar, Plum, 1-Bar, Orange, Lemon and Cherry. There is no Wild Symbol in this slot game. There is no Scatter Symbol in the Bingo Bango Boom online slot game. What sets Bingo Bango Boom apart from other 3-reel, 1-pay line slot machine games is that it has great features and bonus feature games! It has many cool features (Hold, Nudge, Nudge Bank Held, Extra Interest, and Shifta). It also has a fun Bingo Ball Number Trail that has different mini features. The game also has Reel Bonus games that will definitely give you more chances to win! The Hold Feature in the Bingo Bango Boom online slot game occurs randomly and its function is to hold the position of 1 or more reels for the next spin. When the Hold Feature is active, you will see the “Hold” buttons displayed just beneath each of the 3 reels. If you want to hold your reels, simply click on the “Hold” buttons. You can actually hold up to 3 reels. In case you mistakenly clicked Hold on a reel, you just click “Cancel” to reset the Hold buttons, and you can re-select which reels you want to be held for the next spin. When you’re satisfied, click the Spin button. The reels which are not held are the only ones that will spin. Any winning combinations you will form as a result of the Hold Feature are paid out according to their payout table. The Nudge Feature in the Bingo Bango Boom online slot game occurs randomly and its function is to allow you to bump a reel to display the next symbol. You can win up to 15 nudges per spin. When you get to win some nudges, the amount of nudges rewarded to you is highlighted, and the Nudge buttons become active. If you want to know the next 2 symbols on the reels coming up, you can actually use the Sneak Peak Arrows just above the reels (highlighted). Simply click the Sneak Peek Arrows so that you can see the 2 symbols that will be coming up on the reels next. This gives you insight to what will be your next moves on the nudges, therefore helping you build winning symbol combinations. Click on the Nudge buttons to bump the reels and move the symbols downward one at a time. Depending on the reel combination being displayed and the number of nudges you’ve got, you can create winning symbol combinations! Any winning combinations you will form as a result of the Nudge Feature are paid out according to their payout table. The Nudge Bank Held Feature in the Bingo Bango Boom online slot game occurs randomly and its function is to bank your awarded reel nudges. You can win up to 15 reel nudges each spin. The amount of nudges rewarded to you is highlighted, and the Nudge buttons are enabled. If you want to bank your nudges, you can click the Spin button (without using all of your nudges). You can collect up to 15 nudges for the next spin. If you bank your collected nudges, you can be awarded Extra Interest on these nudges. When you are given Extra Interest, extra nudges are randomly added to your nudge total. Please take note that you can carry over your collected nudges to the next spin only. If you do not use your nudges in that next spin, you will forfeit any unused nudges. To use your banked nudges, simply click the Spin button and the Nudge Bank Held will light up, showing you your collected nudges that will be available for that spin. If in case the Extra Interest sign will light up, additional nudges will be included to your nudge total. The number of nudges available is highlighted and the Nudge buttons become active. Click on the Nudge buttons to bump the reels and move the symbols downward one at a time. Depending on the reel combination being displayed and the number of nudges you’ve got, you can create winning symbol combinations! Nudge wins are actually considered as regular wins, and you are paid out according to their payout table. The Extra Interest Feature in the Bingo Bango Boom online slot game occurs randomly and its function is you can win extra nudges. When the current amount of your nudges is banked, the Extra Interest will light up and flash randomly. Extra nudges will be added to your nudge total. When you receive Extra Interest on your nudges, the number of collected nudges will highlight and increase. The Nudge buttons will be activated. Next, the Sneak Peek Arrows that are above the reels will light up. Click the arrows if you want to see the next 2 symbols on the reels, which can help you form winning symbol combinations. You can win up to a 3,000x multiplier on your bet amount as well as extra cool prizes in the Bingo Bango Boom Bonus Feature game! To advance along the Bingo Ball Number Trail, you will be collecting numbers given by random symbols on the reels. Thus, the more numbers you collect, the further you advance along the Bingo Ball Number Trail. When your collected sum is more than 7, the Bingo Bango Boom Bonus Feature game is activated. The Trail Held Feature is random and will hold your position on the Bingo Ball Number Trail until the next spin. This particular Bonus Feature game is composed of a bingo card, bingo machine and 8 Bonus Feature games. The Bingo Card has 27 squares. The Bingo Machine draws out numbers in random and is shown on the Bingo Card. Each of the 8 Bonus Feature games has 3 random numbers linked to it. If the number drawn out by the Bingo Machine matches a number linked to a feature, it is highlighted on the feature. The first Bonus Feature to have all 3 numbers drawn out is the one to be activated. Nudge Mania Up to 15 nudges can be won in this feature. If you activate this one, you are taken back to the main game. The nudges will randomly light up. Click the Stop button to try to stop on the highest amount of nudges. Nudges gotten during the bonus game are assigned random cash values. You can choose to collect or gamble your nudges. If you collect your nudges, you go back to the main game where a win equal to the collected nudge cash value is nudged in. If you gamble your nudges and lose, the feature will end, and you are taken back to the main game. Cash Bingo This is a guaranteed win feature. If you activate this one, the Bingo Machine begins to draw numbered balls. The number on the drawn ball is multiplied by your total bet and included to your winnings. This feature will be repeated until the Bingo Machine draws out a ball labeled Boom. The ball will explode and the feature will end. Full House This is a stop-and-win feature. If you activate this one, the Bingo Card is filled out by numbers. The numbers begin to change quickly. Click on the Stop button to separate a group of numbers on the Bingo Card. The group of 3 numbers you landed on, are added and awarded to you as multipliers. Your bet amount is multiplied by the sum of the multipliers you’ve won. Bingo Bango Boom! This is a random win feature. If you activate this one, the Bingo Card is filled up with numbers. The Bingo Machine begins drawing out numbers. If a number on the card is matched with a drawn number, it is highlighted on the card. Completed lines are paid out: if 1 line is completed on the card, you get a 50x multiplier value on your bet amount; if 2 lines, you get a 200x multiplier; if 3 lines, you get a 3,000x multiplier value on your bet amount! You are only rewarded the highest multiplier value. Multiplier values for completed lines are not included. The feature will end when the Bingo Machine stops drawing out balls. Spin a Win This is a reel-based feature. It guarantees a random win on the reels. If you activate this one, you are taken back to the main game. The reels will spin automatically and you’re guaranteed to get a random win. Balls Up This is a pick-and-win feature. If you activate this, the Bingo Machine will begin drawing balls. Each ball is labeled with a number which is a multiplier value. Click the Collect button to collect one of these balls, or you can continue playing to get a more valuable prize. If you do not click on the Collect button, the Bingo Machine will stop and collect a random prize. Your total bet amount is multiplied by the number shown on the ball. Eyes Down This is a reel-based feature. If you activate this one, you are taken back to the main game. The reels will spin and you can click on the Stop button to stop the reels on a winning combination, before the reels fully stop. House of Cards This is a reel-based feature. If you activate this one, you are taken back to the main game. The symbols shown on the outer position of the reels will flash consecutively. Click the Stop button to stop on a symbol. The symbol you activate will complete a winning combination automatically. Random symbols seen in the Bingo Bango Boom slot game may contain Bonus labels. When a symbol with a Bonus label is shown on the pay line while playing the regular Bingo Bango Boom slot game, you will activate the Reel Bonus Feature game. Take note that you can win up to 3 chances to play the Bonus Features. The symbols that have the Bonus labels may be seen on the 1st, 2nd and 3rd reels on an active pay line. Thus, you can repeat the Reel Bonus Feature game for each symbol that has a Bonus label shown on the pay line. When the Reel Bonus Feature game is activated, different features will flash randomly in the window. Simply click the Stop button to win 1 of the following features below. Boost You are boosted up to a random location on the Bingo Ball Number Trail. Selector Groups of Bingo Ball Number Trail locations will light up and flash randomly. Click the Stop button to try activating the Bingo Bango Boom! Bonus Feature game. Skillshot The Bingo Ball Number Trail locations will light up in sequence. Click the Stop button to try activating the Bingo Bango Boom! Bonus Feature game. Stoppa The Bingo Ball Number Trail locations will light up. Click the Stop button to try activating the Bingo Bango Boom! Bonus Feature game. Bingo Bango Boom has 3 reels where you may bet on 1 pay line. The minimum bet is 0.10 and the maximum bet is 10.00 per line. You can wager 1 coin only per pay line. Thus, the minimum bet amount is 0.10 and the maximum bet amount is 10.00 per spin. Please take note that the amounts mentioned are in Pounds, but they will remain the same if you choose to play in US dollars, Euros, or Canadian dollars. The maximum payout in the main Bingo Bango Boom online slot machine game is 500 coins. Bingo Bango Boom does not have an Autoplay function.